This game is also called Othello. Players take turns placing discs of their assigned color. During a play, any discs of the opponent's color that are in a straight line and bounded by the disc just placed and another disc of the current player's color are taken. They are turned to the current player's color. There must be at least one disc taken for the placement to be valid. The object of the game is to have the majority of discs of your color when the last move is performed. Then the "fixed" the bugs. Now the gane doesn't work. It turns pieces at random, it closes at random, it won't load -- at random. it's ruined. I would have to say, that this is a great game. 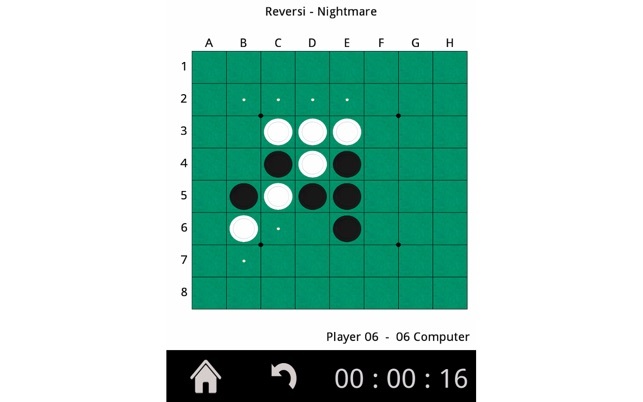 The only free othello game on the app store, I am grateful that someone decided to finally put this on for the enjoyment of others. I mean, seriously people, we need more othello games! The only complaint is the slow animation, but that can be overlooked because of how great the game is. This game is fun and keeps you wanting to do it again .